As internet access continues to grow worldwide, the opportunity to reach an international audience has never been greater. But how will you reach them? Building a blog can help improve visibility and set your business apart in today’s competitive global online landscape. But driving a consistent level of substantial traffic to your blog is tough. It takes a ton of hard work, long-term commitment and virtuous patience. Luckily, boosting traffic to your blog is easier when you know how. But with so much information on traffic generation, it can be difficult to know where to start. In this article, you’ll learn 21 proven techniques to drive more targeted traffic to your blog from across the world. I’ve also included my secret traffic driving tips. The type of content you create has a big impact on your blog’s potential to drive traffic. So, let’s start by covering how to create content that drives traffic from around the world. These topics should be interesting and relevant to the key target markets you want to reach. Hot news stories always gain a lot of attention, but you need to be the first to publish them to gain substantial traffic. Try adding your own original insight on hot industry topics to set yourself apart. My favorite strategy is to create evergreen content: timeless content that retains relevancy and will generate a stream of sustainable traffic over time. It certainly offers the best return on investment for your time because the content won’t be out of date one month later. A classic example is a how-to guide to overcome a commonly encountered problem. Differentiate your content by offering a novel perspective or an alternative way of doing things. Top tip: Take note of what questions people are asking in your niche by checking comments on popular blogs. Create posts addressing commonly asked questions not yet addressed in other blog posts. For example, you could ask a Chinese marketing influencer to write about how to leverage Sina Weibo. You’ll get better content due to their experience with the topic, and the influencer will share their guest article with their audience. The influencer’s name alone will attract a whole new audience to your blog. Top tip: Make it easy for influencers to share your content by mentioning them in your social media updates to promote the content. You can publish the content from these sessions on your blog. Share the link to the published blog post with the contributors to the post so they can share it across their own networks. In addition to driving traffic back to your site, referencing names of prominent figures will capture people’s attention and boost your authority too. Top tip: Reach out to people who have just published a book as they are often looking for ways to promote it to a wider audience. An interview is perfect for this. Regularly updating your blog with new content will help you rank better in search engines, which means more people will visit your site. Remember, whilst Google loves fresh content, quality is the real driver. Top tip: Maintain a balance between quality and quantity of your content. Under no circumstances, jeopardize content quality for content quantity. There are some additional things you can do in each blog post that will make a big difference to its global traffic driving potential. Ensure your headline clearly communicates the value the audience will get from reading the post. If your blog post addresses a topical issue or offers valuable ‘how to’ advice, include relevant keywords in the headline. To reach an international audience, check these benefits are relevant beyond your home market and make sure that your headline will be understood across different countries. Take care to avoid local slang or regionally specific references that may not be understood outside the local vicinity. Top tip: ‘How to’ headlines are one of the best traffic generating headlines. They deliver a lot of value to the reader and stay relevant over time. This is crucial for ensuring your content ranks in search engines. Use the Google Keyword Planner to check how many people are searching for your selected keywords globally and in your key target regions. Google Trends is useful for identifying the countries ranking highest for searches of your keywords. Top tip: Remember to include keywords in the title, meta description and link. Images create another traffic source through Google images. Images should not be there to look pretty. They should add context or illustrate a point you are trying to make in your post. Don’t forget to include an eye-catching feature image at the top of every post. Using an intriguing or unusual image can pique readers’ interest before they have even read a single word. Top tip: Include relevant keywords in the Alt Image tag on your images. Review your posts and look out for opportunities for internal links. This enhances user experience by directing them to other relevant content. It also helps boost your search rankings by keeping them on your website for longer. Top tip: Don’t overuse internal links and be sure to only include relevant internal links…or you risk creating an article that looks like spam. As Google owns YouTube, including videos in your posts is an excellent way to drive traffic to your site. Videos also help break up the text and can be a good way to illustrate specific points. Top tip: How-to content often works well with video. If you are demonstrating how to do a specific process, video makes it easier for people to follow and for you to explain. Who are the key influencers in your niche? Identify influential figures that are well known across your key target markets. Including relevant references to them in your posts increases the authority of your own content. As the influencers check their incoming referrers to see who is talking about them, they may notice your post and link back to you. Top tip: Don’t force links into your posts. Only include relevant links that fit in with the natural flow of the article. Ignoring the following factors will destroy the shareability of your blog content. Luckily, these small tweaks are easy to do and are guaranteed to improve the traffic-driving potential of your blog. People are increasingly accessing web content through their phones. But layout can change radically when fitting content onto smaller screens. So, ensure your site can be viewed on a range of devices. Top tip: Check different parts of your site on your phone, iPad and desktop, and ensure the content displays well and offers the best user experience on whatever device they use. Slow load time = a poor user experience, which translates into high bounce rates. Google penalizes sites that load slowly. So, use PageSpeed Insights and check how you can make your site run faster. Top tip: Images are a huge culprit for reducing site speed. So check image file sizes. If they are too big, use tinypng.com to optimize image size for your posts. This encourages readers to share posts they enjoyed with their networks. This is simple to set up with a plugin if you have a WordPress site. Top tip: Place your social share buttons in prominent positions. Maximizing visibility increases chances of people seeing them and then sharing your posts on their favorite networks. Are you spending enough time on promoting your blog posts? If you are like most of us, you probably dedicate more time to content creation than content promotion. But by doing this, you are missing out on so many traffic-driving opportunities. Stop neglecting content promotion and give your blog posts the attention (and traffic) they deserve. Read on to learn my favorite strategies. Try to build connections with prominent figures in your field that have international reach as well as with influencers in your key target countries. To get started, you need to work out where these influencers hang out and start interacting with them on these networks. Be sure to comment and link to their blogs and they may visit your site too. Read this post on how to leverage influencer marketing to best effect. Top tip: Don’t just network with influencers. Your peers can be great allies. They are more likely to share your content than big influencers. So, you can help each other. Doing guest posts on respected blogs within your niche has obvious payoffs: their readers are far more likely to visit your blog and engage with your content. For instance, if you write about social media, submit your articles to blogs in that niche such as Social Media Examiner. However, don’t constrain yourself too tightly. Guest blogging on sites that focus on different but related topics will increase your exposure to lots of new readers. Top tip: Doing guest posts on blogs in your key target markets can be a good way to build your authority and drive traffic from those specific regions. Capture people’s interest by providing valuable, insightful and thought-provoking comments. Adopting a confident voice will help cement your authority and bring people back to your site. Top tip: Maximize your exposure by being the first to comment. As they pull leading blogs from across the web to a single location, getting in AllTop.com offers a great source for permanent, relevant links to your blog. Top tip: Take time to review your posts before submitting and ensure they are top quality to improve your chances of success. Does your target audience spend most time on Facebook, Twitter, or more niche platforms? Move outside your home country and you could encounter a very different social media environment. Consider China. Facebook is banned. There are numerous Chinese-specific social networks, including Qzone, WeChat, and Sina Weibo (Forbes). Whilst these networks are very popular in China, they have barely reached beyond those borders. Once you have identified your key social media channels, consider the types of messaging you will use to promote your post. Using the blog post title is the easiest solution, but you could pull an excerpt, identify a key question or takeaway from the article, and use that as the focal point for your message. Top tip: Tailor the messaging in your social media updates for the specific networks you use to promote your content. As it becomes ever more challenging to get organic exposure on social media, paid search and social media advertising are effective ways of attracting new visitors to your blog. Top tip: Investigate where your audience spends most time online before deciding which network to invest your money in. The keyword here is relevant. There are lots of subreddits to choose from. Take time to identify the most relevant, check the type of content others have submitted and ensure your content fits in. Top tip: Be sure to check the guidelines of the subreddit before submitting to ensure promotion of blog posts is welcome. Your subscribers opted in. So, they like your content and want to hear what you have to say. Don’t yet have a list of subscribers? Start building your list with a compelling opt in offer. To do this, give away a free resource that addresses a key challenge faced by your target audience. It should be easy to consume and add value to the content they have read on the blog. Read this post for guidance on how to build an email list. Top tip: Use a double opt in to ensure you have people’s full permission before you send them updates. 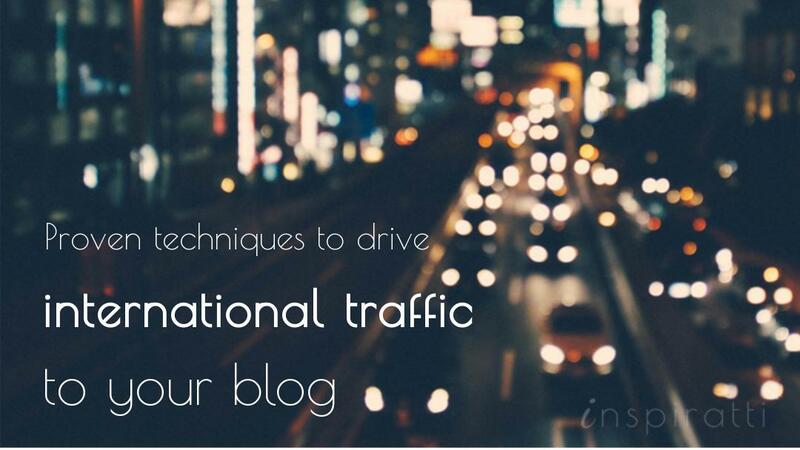 Driving traffic is crucial to the success of your blog. Without traffic, you have no audience. And without an audience, you have no one to read the content you have spent so long carefully crafting. Using the techniques outlined in this post will help you to increase the volume of targeted quality traffic to your site. But don’t just apply them blindly. You need to apply them in the context of your own business and audience you are trying to reach. To be successful, you need to focus on what works for you. You need to understand the needs and behavior of your target audience. You need to get to grips with your analytics and identify your main traffic drivers. This will help you focus your efforts on how you can further develop the most promising traffic opportunities. Great sharing related to blog traffic and how you can manage things from different kind of sources and learn something new in the industry of social media and improve your performance.